In man, the total body water is about 60% of body weight and in 70 kg body weight, it is around 40 lit. This is the total body water (TBW). It is distributed between intracellular (ICF) and extracellular fluid (ECF) compartments. ICF in the total body water forms two third and the remaining one third is the ECF. The ECF contains the plasma and interstitial fluid. Interstitial fluid includes another compartment called transcellular fluid, consisting of CSF, aqueous humor, synovial fluid, and the secretions of GI tract. The water moves from one compartment to another following the osmotic force and in normal conditions, the volume of water in each fluid compartment is kept within the normal range. Fluid volume can be determined by injecting a substance which can be distributed in the space that is being selected and finding out its mean concentration in the plasma. The fluid compartment that is more susceptible for the fluctuation is the ECF and kidneys show regulatory mechanisms to maintain its volume constant. The ECF volume is regulated, mainly by Na+ and Cl– ions, which are present in higher concentration in the extracellular compartment. The tonicity or osmolality of the ECF is also due to NaCl concentration. Changes in the sodium level in ECF, thus, can greatly affect ECF volume and its tonicity. Whenever, ECF volume is changed, it affects blood volume, which in turn affects the cardiovascular function. For example, the fall in ECF volume can lead to fall in the blood volume and fall in the arterial blood pressure. If the fall in blood pressure is significant, it can lead to circulatory shock and death ensues, if immediate remedial measures are not taken. Loss of water from ECF is commonly observed in dehydration states, as in burns, vomiting, diarrhea and excessive sweating. The volume of the ECF can increase, if there is excess water or fluid intake. The ECF volume is also subjected to fluctuations, due to osmolality changes of plasma. Increase in the plasma osmolality, as in excess NaCl (salt retention), leads to retention of water, which raises ECF volume. Loss of salt from the body leads to decrease in plasma osmolality and also decrease in ECF volume. From the aforesaid description, it can be understood that ECF volume can change, due to changes in the plasma osmolality. So it becomes necessary to discuss both the regulations of water and Na+ balance to understand the total body water balance. Thirst center is situated in the hypothalamus near the third ventricle, very close to the neurons secreting the ADH hormone. Rise in the plasma osmotic pressure, fall in the ECF volume, drying of pharyngeal mucosa stimulate the thirst center. The hormone angiotensin II directly acts on this center and stimulates thirst. The stimulation of this center leads to the drinking behaviour. Fall in ECF volume, rise in osmotic pressure of plasma are the important stimuli for the supraoptic and paraventricular nuclei of the hypothalamus to secrete ADH. This hormone is transported along the hypothalamohypohyseal tract and released from posterior pituitary. ADH acts on the distal tubules and changes the permeability of the tubular cells for water. The reabsorption of water from these segments leads to rise in the concentration of the final urine that is excreted. This is a regulatory mechanism to maintain the water balance. The immediate response to fall in the ECF volume is increase in the sympathetic activity. The decrease in ECF volume causes fall in blood volume and arterial blood pressure. The absence of baroreceptor stimulation causes the reflex stimulation of the sympathetic nervous system. The sympathetic stimulation of the renal blood vessels causes, decrease in renal blood flow, which in turn reduces GFR. This reduces the urine flow rate, which regulates ECF volume. Renin-angiotensin secretion is stimulated, whenever there is a fall in ECF volume, fall in blood pressure, fall in sodium level and rise in K+. Angiotensin II acts at the proximal, distal and collecting segments and causes Na+ reabsorption. It also causes the stimulation of aldosterone secretion from the adrenal cortex. The formation of angiotensin II, helps to raise arterial blood pressure by its vasoconstrictor action and also through Na+ reabsorption. 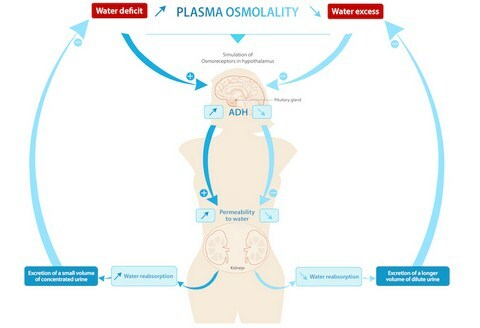 The body water raises, due to reabsorption of sodium and increased intake of water arising from the stimulation of thirst by the action of angiotensin II.